Man did I like this comic a lot. This comic was fun and dope. This issue was my first of BOOM! 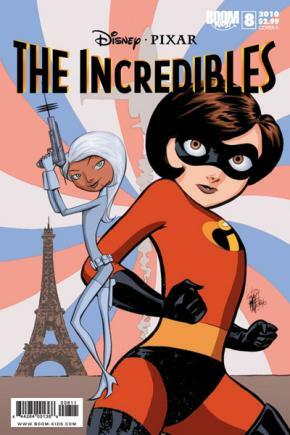 Studios’ Incredibles comic and they did make a fine impression on me. This comic felt very much like the film in terms of its wit and delivery. It also has that wholesomeness that really sold the concept of the family as a superteam. The plot of this issue is pretty simple; Elasti-Girl has to team up with Syndrome’s right hand girl to stop a recently resurfaced supervillain from her past. The issue reads like a buddy cop movie since neither of them really likes the other for different reasons. The B-plot in this comic is Mr. Incredible dealing with the kids by getting Violet a job and having Dash go with him and Frozone on patrol to learn how to be a superhero. Those moments were really funny to me since it had this feeling of a good sitcom where the Dad is trying hard, yet failing to a certain degree with interacting with his children. Marcio Takara’s art in this is really good. His figures stand out and emote well. None of the characters look off model. The storytelling is done well enough so that the visual jokes pop like they are supposed to. The backgrounds, while not detailed, serve well to let you know a setting, which I must say for my tastes is all I really need. This comic is good if you want an entertaining super hero comic that doesn’t have anyone getting ripped in half, turned to salt, or an arrow in the dome. This comic is perfect to give to a kid, and have them experience some fine comic book fun.